The U.S. government's Food and Drug Administration proposed on Thursday a stricter recommended limit on the amount of lead, a highly toxic metal, allowable in certain Mexican-style children's candies. The list includes spicy lollipops widely sold in many Hispanic neighborhoods in the United States. The FDA now recommends that candies likely to be eaten by small children not contain more lead than one-tenth of a part per million, an 80 percent reduction from the previous, decade-old recommended level of one-half part per million. The amount of lead represented by the new level does not pose a significant risk to small children, the agency said. The National Confectioners Association said it supports the new guidelines. The Virginia-based trade group's members include Mexican candy manufacturers, as well as U.S. candy makers with factories in Mexico. 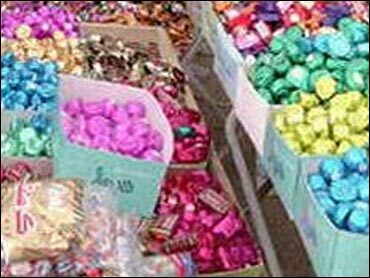 "Today, the FDA sent a clear message that all candies sold in the United States, regardless of their country of origin, must meet the same, stringent safety standards," association president Larry Graham said. Most domestic and imported candies already meet the stricter lead threshold. However, the FDA moved to lower the limit after the sampling of dozens of types of candies imported from Mexico and after information from other sources revealed additional ingredients used in some sweets can boost the lead content beyond allowable levels. Those ingredients include chili powder, tamarind pulp and salts used in lollipops and salty powdered snack mixes that an FDA official said are sold in "significant quantities," predominantly in Hispanic neighborhoods around the country. The lead is believed to come from improperly washed and stored ingredients grown in lead-contaminated soils, as well as candy wrappers printed with inks containing the metal. The new guidance should take effect next year, the FDA said. The agency will go after manufacturers that flout the new guideline only after taking into account whether their products are typically consumed by small children, said Michael Kashtock, a senior adviser and special assistant in the FDA's Division of Plant Product Safety. Other confectionary products, including dark chocolate, can contain trace amounts of lead but are not typically eaten by young children.